I have to say a few words about an affliction that I have a love/hate relationship with. If you don't know the affliction by name, it's when a song gets stuck in your head, sometimes for hours, and you can't get it out. For me it usually repeats a single line of a song over and over. Sometimes it's a catchy lyric and other times it's just annoying. For myself, if you add this affliction on top of a bad case of Pulsatile Tinnitus (think, a whooshing sound in one ear 24/7) and, well, you've got a party in your head that you never wanted to go to. I mentioned this affliction in Dirty Shirt when we were deep in the quite woods of the BWCA and I was haunted for two whole days by a U2 song, Another Time, Another Place. When it first happened, I kind of welcomed it. It was like having a Walkman (at the time) when we were in the middle of nowhere. After 4 hours, the novelty wore off and I started to go a little insane. I sometimes wonder if there isn't some subtle message behind what comes to the top of the ear worm playlist. It could be a song triggered by some sort deep seated thought, anxiety or preoccupation. 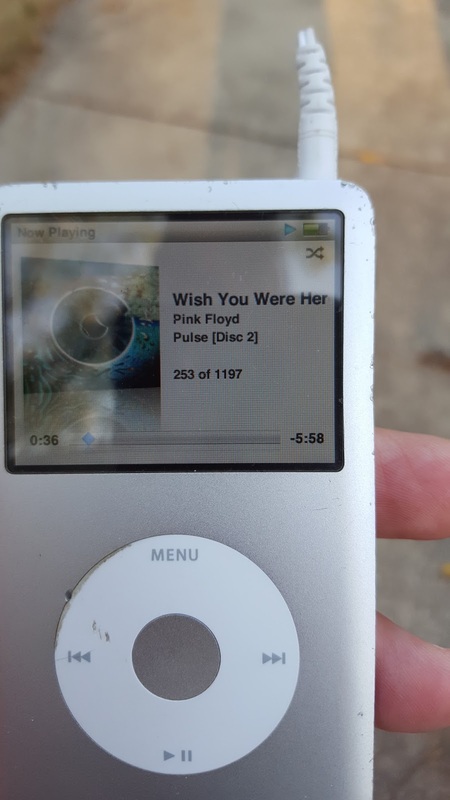 For example, today the ear worm was, and still is, Wish You Were Here, by Pink Floyd. Do I secretly wish someone was here? Who? If they showed up, would the song stop? It's a great song, but it's been on repeat for 12 hours now, and it can stop anytime. Then, out of nowhere, the song comes up on my iPod which is randomized. It was one of 1223 songs on my iPod and today it manages to come on. What are the odds, and what is it trying to tell me? Another memorable one was Zombie Zoo, by Tom Petty. This is a silly, crazy song that ran through my head for 2 days while fishing in Canada. Of all the good songs that Tom Petty has made, how did I manage to get his worst song ever stuck in my head. The song speaks of goth girls getting all made up and going dancing at the Zombie Zoo, which may or may not be a real club somewhere. It certainly seemed real in Canada after two days. Fishing and other quiet activities seem to promote the worm effect. Last time I was up in northern Wisconsin, the B52's song Rock Lobster was stuck in my head, in part because it was played during the previous nights revelry and festivities. And as much as I would never wish that one on anyone, there it was the minute my buddy mentioned it the next morning. And there it stayed. So, I don't know if there is a cure for this affliction. Sometimes listening to something else will cancel the song out. More often the new song becomes the worm and the old one is forgotten. There is no medication for this problem, of that I'm fairly certain. Maybe I should back off the music a little. Though, who knows, maybe that will only make the problem worse. If there's someone out there who can fix the problem, I Wish You Were Here.